The Mishimoto BMW N54 Baffled Oil Catch Can is designed and engineered to reduce carbon buildup, a common issue with the direct fuel injection N54 engines. The Mishimoto BMW N54 catch can kit uses the proven engineering from the Mishimoto 2-Port Compact Baffled Oil Catch Can with a bronze filter, and internal baffled to better separate the oil from the crankcase vapors. The engineers at Mishimoto designed a CNC-machined lid which features large inlet/outlets in order to match the inner dimension of the CCV hose. This baffled oil catch can will defend your intercooler, intake system, and VANOS system from oil-blowby and help maintain proper octane levels to reduce potential detonation. 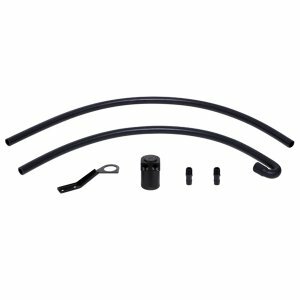 The kit comes with two direct-fit hoses, which require no modification to the engine cover, and one direct fit mounting bracket that not only is extremely easy to install but also mounts the can in a serviceable location! Two plastic, 3/4” barb fittings connect the hoses to the can. And, like every Mishimoto oil catch can, this baffled catch can kit comes with the Mishimoto Lifetime Warranty!